I am now working my way through Chapter 8 of Everitt's book, which deals with religious experience. In this first part I will consider whether experience is an alternative to argument or not. Some of this material overlaps with the previous discussion of Plantinga. What are Religious Experiences supposed to do? On a beautiful fall day, as I was hiking in the Cascade Mountain, the majesty and beauty of God's creation overwhelmed my resistance. 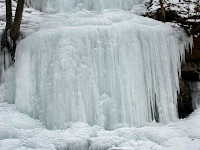 As I rounded a corner and saw a beautiful and unexpected frozen waterfall hundreds of feet high, I knew the search was over. The next morning I knelt in the dewy grass as the sun rose and surrendered to Jesus Christ. That is, of course, Francis Collins describing a religious experience he had. It was so powerful that it converted him to Christianity from atheism (see The Language of God - his experience may have be a "straw that breaks the camel's back" phenomenon). What are we to make of Collins's RE? Two significant questions seem to arise: (a) If I had such an experience, should it convince me of the truth of God's existence? and (b) If someone else told me they had such an experience, should it be enough to convert me to their faith? Defenders of arguments from RE (call them experientialists), have, on separate occasions, answered both questions in the affirmative. We need to see whether they are right to do so. The first line of defense for experientialists is to claim that REs give direct epistemic access to God. With such access, no argument is needed. This claim brings us back to the idea of a basic belief -- that is: a belief that needs no justification. Uncontroversial examples include my belief that "1+1=2" or my belief that "I am in pain". These beliefs are self-justificatory. Are REs in the same category? Take my experience of the cup I am holding. I can see it, I can touch it and I can say that it exists. I do not need to infer its existence from my experience; its existence simply is the content of my experience. Experientialists claim that REs are like this. A-inferences: these are inferences that are used to arrive at a belief. J-inferences: these are inferences that are used to justify a belief. The importance of the distinction is easily captured with the following example. Your romantic partner comes into the room, you look at them and say to yourself "He/she/it's angry". You arrive at this belief without making any inferences (no A-inferences). 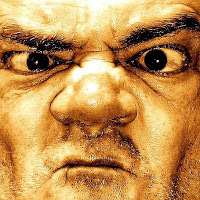 In other words, you do not look at them, examine their frown, identify a general principle stating that people with such an expression are usually angry, and conclude that he/she/it is angry. You jump straight to the belief. However, if someone were to ask you how you knew that they were angry, you would be forced to justify your belief (use J-inferences). It would not be enough to say simply that your experience proved their anger. The distinction between these two types of inference can be used to develop criteria for establishing whether something is a basic belief. If we consider an uncontroversial example, such as my belief that I am in pain, we see that it needs neither A-inferences or J-inferences: the experience of pain is the full content of the belief and if I told someone I was in pain they would not ask me to justify my belief. So a belief that needs neither type of inference is definitely basic. What about beliefs that involve inferences of either kind? They could not really be included within the category of basic beliefs. Because they are based on inferences of some kind, they are always open to challenge. Are Religious Experiences Properly Basic? The final question to be addressed in this post is whether or not REs involve inferences. To answer this we need to look at some REs. 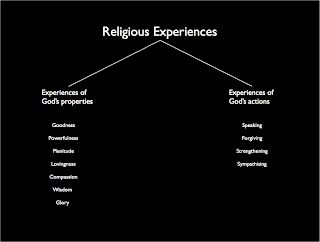 This suggests that there are two main varieties of RE: (a) experiences of God's properties; and (b) experiences of God's actions. Both of these types of experience involve inferences of some kind. Let's go back and consider Collins's experience of the frozen waterfall. It seems clear that Collins's experience falls into the first of Alston's categories: through observation of nature, Collins experienced some property (glory or power) of God. It seems equally clear that there must be an inference underlying the experience. Collins had a conscious experience of one kind (of nature), deemed it to be impossible unless there was a God, and so reached the conclusion that it really was a direct experience of God. I have had conscious experience X.
I would not have had experience X without there being a God behind it. Therefore, my experience is of God. In sum, REs are more like "X is angry" than "I am in pain". And because they are like this they are open to all the challenges that arguments are usually open to. We will consider those challenges in future posts.